Grand Junction, Colorado is the regional center of commerce for western Colorado and the largest city on its Western Slope. The city sprawls across the Grand Valley of Colorado, ideally located for those seeking an adventure into northwestern Colorado's terrain. Whether arriving by air or ground, you will easily find your way around Grand Junction and its many neighboring vacation destinations. Planes, trains, automobiles and buses make it easy getting here to Grand Junction, Colorado. Via Interstate 70, Grand Junction is a 240-mile drive from Denver, 270-miles from Salt Lake City, and 90-miles from Glenwood Springs. Via U.S. Highway 50, Grand Junction is a 153-mile drive from Durango, Colorado, and 198-miles from Farmington, New Mexico. If you are not driving, a quick flight from Denver, Salt Lake City, or Phoenix puts you into Grand Junction's Walker Field Airport, providing easy access to destinations throughout western Colorado and eastern Utah. Or you can catch the California Zephyr to Grand Junction on Amtrak's most popular route. There are numerous hotels and restaurants to choose from once in Grand Junction, and in any direction you are promised fun and adventure. To the east is the Grand Mesa, highly regarded for its lakes and forests especially in the autumn season. To the west is the Colorado National Monument, similar to the Grand Canyon's variance of rock formations, steep drop-offs, and high vantage points. Rimrock Drive is a 23-mile road that is famous for its scenic splendor of the Colorado National Monument. South bound is the lush Western Slope agricultural oasis where local farmers grow everything from sweet corn to cherries. And to the north are the Little Bookcliffs. This area is renowned for its sheer rippled walls of stone that descend from the mesa top to the valley floor. Grand Junction is an excellent hub to the greater outdoor opportunities in its surrounding area. However, you will find the downtown area offers great shopping, dining and lovely architecture in an excellent year round climate. 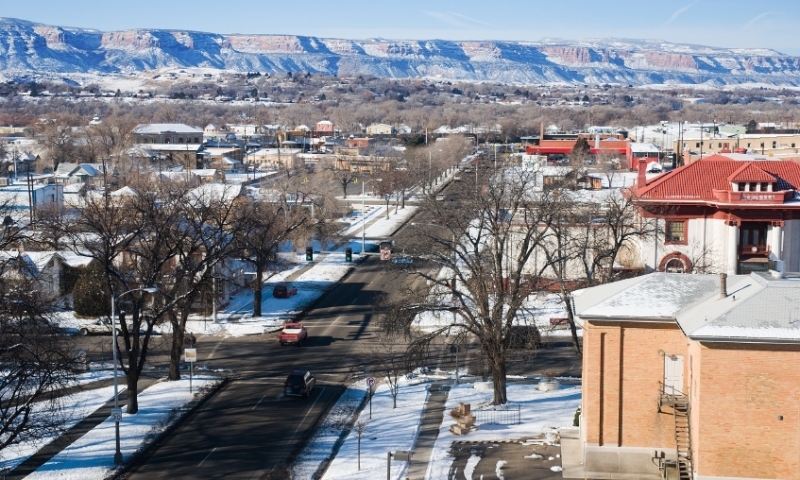 Begin your next Rocky Mountain adventure in Grand Junction, Colorado!